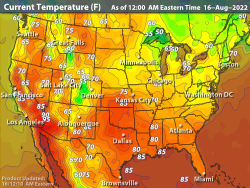 The Current Temperature map shows the current temperatures color contoured every 5 degrees F. Temperature is a physical property of a system that underlies the common notions of hot and cold; something that is hotter generally has the greater temperature. Specifically, temperature is a property of matter. Temperature is one of the principal parameters of thermodynamics. On the microscopic scale, temperature is defined as the average energy of microscopic motions of a single particle in the system per degree of freedom. On the macroscopic scale, temperature is the unique physical property that determines the direction of heat flow between two objects placed in thermal contact. If no heat flow occurs, the two objects have the same temperature; otherwise heat flows from the hotter object to the colder object. These two basic principles are stated in the zeroth law and second law of thermodynamics, respectively. For a solid, these microscopic motions are principally the vibrations of its atoms about their sites in the solid. For an ideal monatomic gas, the microscopic motions are the translational motions of the constituent gas particles. For a multiatomic gas, vibrational and rotational motion should be included too. Temperature is measured with thermometers that may be calibrated to a variety of temperature scales. 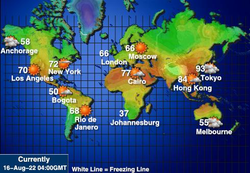 In most of the world (except for the United States, Jamaica, and a few other countries), the degree Celsius scale is used for most temperature measuring purposes. The entire scientific world (the U.S. included) measures temperature using the Celsius scale and thermodynamic temperature using the kelvin scale, which is just the Celsius scale shifted downwards so that 0 K= −273.15°C, or absolute zero. 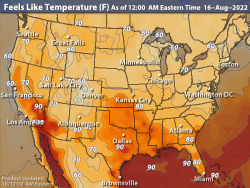 Many engineering fields in the U.S., especially high-tech ones, also use the kelvin and degrees Celsius scales. 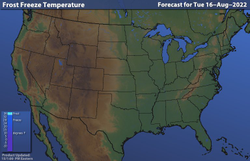 However, the United States is the last major country in which the degree Fahrenheit temperature scale is used by most lay people, industry, popular meteorology, and government. Other engineering fields in the U.S. also rely upon the Rankine scale (a shifted Fahrenheit scale) when working in thermodynamic-related disciplines such as combustion.